Home » Food and Nutrition » What Is Soy Lecithin and Why Is It in My Food? What Is Soy Lecithin and Why Is It in My Food? If you’re a person who typically reads nutrition labels, you may have come across the additive “soy lecithin” at some point. It is so popular that it is one of the top 10 most used ingredients in processed foods. But what is soy lecithin exactly? And more importantly, is it safe to consume? What Is Soy Lecithin Used For? 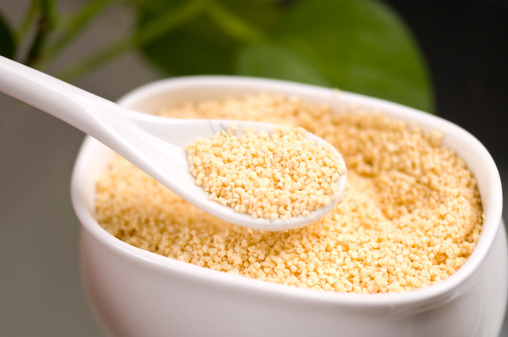 Lecithin comes from a variety of plant sources, including soy. It’s often dry and grainy and used as an additive in foods. Soy lecithin is popular mainly due to its emulsification properties; it helps water and oil mix together, making it a perfect additive in salad dressings, reduced-fat buttery spreads, mayonnaise and other processed foods. With chocolate bars, soy lecithin ensures that the cocoa butter and cocoa doesn’t separate. It also assists with baking as it prevents dough from sticking to the pan and improves its ability to rise. In addition, lecithin is a surfactant/wetting agent. Surfactants will reduce the surface tension of liquids, allowing them to spread out quicker and be absorbed faster. You will often see lecithin added to cake and other baking mixes so water stirs in more easily. Finally, since soy lecithin is extracted from soybeans, and soybeans are considered one of the cheapest crops in the U.S., it’s beneficial for food manufacturers to use this cheap, soy-derived emulsifier in food processing. Promotes weight loss: Lecithin speeds up the breakdown of fats, and as a result can boost your metabolism. Because it is natural, lecithin allows you to lose weight without relying on harmful drugs. Lowers cholesterol: Soy lecithin helps dissolve fat so it won’t build up in the arteries. It lowers bad cholesterol levels and reduces the risk of cardiovascular diseases, like atherosclerosis. Improves cognitive function: Studies show that choline-rich soy lecithin can help improve cognitive function, boost brain development and improve memory retention. Beneficial for the liver: Lecithin can help flush out toxins and prevent fats from accumulating in the liver. Gluten-Free: Because soy lecithin is made from soy and not rye or barley, it is considered gluten free. Allergies: If you experience hives, rashes or itchy skin after consuming soy lecithin, these are signs of an allergic reaction. A weakened immune system that releases too many antibodies to combat allergens may also cause these side effects. Hormonal interference: According to a study published in Food and Chemical Toxicology, soy lecithin is strongly estrogenic. Soy’s estrogenic compounds have been shown to disrupt thyroid and endocrine hormone production. This means that it can interfere with digestion and prevent the absorption of minerals. Low blood pressure: Consuming excess soy lecithin can lead to low blood pressure. Low blood pressure can lead to adverse side effects, including difficulty breathing, wheezing, headaches, and dizziness. Malabsorption: Because some people don’t digest lecithin properly, it can lead to strong body odor and bad breath. Gastrointestinal complications: Excess consumption of soy lecithin can cause several unpleasant gastrointestinal problems including abdominal pain, diarrhea and nausea. Some people associate the long lifespans of people across Asia with the high amount of soy being consumed there. Keep in mind that individuals in Asian countries consume high amounts of fermented soy products. The fermentation process makes it easier to digest. Most of the soy products that Americans consume are genetically modified. When we consume genetically altered food sources it can confuse our bodies. In 2008, a team of researchers conducted an analysis on 22 randomized control trials that analyzed the health benefits of soy products. They concluded that soy isoflavones slightly lower LDL cholesterol but have no effect on HDL cholesterol or blood pressure. Soy has been viewed as a heart-healthy alternative to meat, but based on these findings, these claims may be incorrect. It may be difficult to avoid genetically modified soy lecithin in North America, but soy lecithin actually contains little soy protein and lecithin might not contain any measurable protein at all. So many of the risks associated with GMOs aren’t applicable for soy lecithin. Anderberg, K., “Is Soya Lecithin Gluten Free?” Livestrong.com, last updated June 17, 2015; http://www.livestrong.com/article/521952-is-soya-lecithin-gluten-free/, last accessed November 10, 2015. Weingarten, H., “What is Soy Lecithin and Why is it Found in So Many Products?” Fooducate web site, July 7, 2009; http://blog.fooducate.com/2009/07/07/what-is-soy-lecithin-and-why-is-it-found-in-so-many-products/. Greene, A., “Soy Lecithin: Why Is It In Everything?” Huffington Post web site, last updated May 18, 2013; http://www.huffingtonpost.com/amanda-greene/soy-lecithin-why-is-it-in_b_2891780.html?ir=India&adsSiteOverride=in, last accessed November 10, 2015. “Soy Lecithin Benefits: 5 Amazing Benefits of Soy Lecithin You Need,” Vitguide web site, http://vitguide.com/soy-lecithin-benefits/, last accessed November 10, 2015. “Soy Lecithin,” Med-Health.net, http://www.med-health.net/Soy-Lecithin.html, last accessed November 10, 2015. Cann, K., “The Whole Truth About Soy Lecithin,” Breaking Muscle web site, http://breakingmuscle.com/nutrition/the-whole-truth-about-soy-lecithin, last accessed November 10, 2015. Tags: Benefits And Side Effects, Food Additive, Soy Lecithin, Soy Lecithin Benefits, Soy Lecithin Gluten, Soy Lecithin Side Effects, Soy Lecithin Use, What Is Soy Lecithin, What Is Soy Lecithin Used For?